Make your home for sale feel warm and cozy without going too overboard. You might think that selling your home during this season is not worth the home staging. But buyers who venture out during this season are more serious compared to their springtime counterparts. With that being said, it is important to keep staging at its finest even in the fall. Here are some staging tips to sell your home this season. Avoid over-decorating as these fall embellishments might take away the focus off of your home. Accentuate its best features and create an inviting setting with vases of fall foliage. A fresh coat of paint will surely invigorate your home’s interiors. Try shades of caramel or cream that’s neutral yet warm and use accessories in deep reds and oranges for that total fall vibes. With shorter days during fall, it is essential to have adequate lighting to highlight your home’s best assets. Use as much natural light as possible. Encourage potential homebuyers with a warm and cozy atmosphere during showings. Put out throw pillows and plushies, and decorate your fireplace to draw attention. 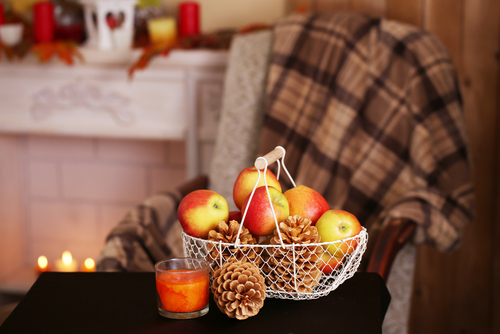 Fall means aromas of apples and cinnamon, so why not take advantage of the inviting scents for this season? You can’t let your potential buyers in if they don’t find your exteriors appealing in the first place. Since it’s the fall season, rake up leaves in your lawn and patch up brown spots in the grass. It helps to keep the curb clean. Don’t let buyers slip away with an unpresentable home for sale. Staging is easy, and fall is the perfect season to get that new owner for your house!